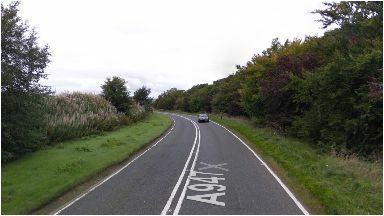 The crash happened on the A947 near Whiterashes in Aberdeenshire on Monday morning. A road has been closed in Aberdeenshire after a four-vehicle crash during rush hour. Emergency services were called to the scene on the A947 near Whiterashes after the smash at around 9.20am on Monday. A police spokesperson said there were no serious injuries, but the road remains closed in both directions while they investigate. Earlier in the day, police warned drivers of icy conditions in the area. "Icy conditions across Aberdeenshire at the moment - in particular at the Cairn O' Mount" they tweeted. "Please drive with caution if you are using our roads this morning and stay safe." A spokesperson for Police Scotland said: "We were called to a two-vehicle crash on the A947 near the B993 junction around 9.20am this morning. "An ambulance was requested but there does not appear to be any serious injuries. "Officers are still at the scene and the road is blocked."